Services are FREE to all registered CSU students including CSU-Dayton. Many college students that leave home for the first time may experience various emotional concerns. Some problems may include: adjustment to college life, family concerns, low self-esteem, lack of self-confidence, general anxiety concerns, difficulty concentrating, relationship concerns, stress, depression, and academic and financial concerns. Support is available for all enrolled CSU students. 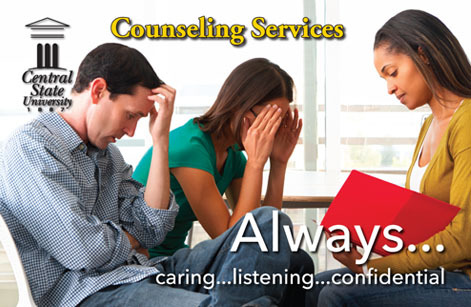 Counseling Services is conveniently located in the Lackey-Lee Health Building alongside Student Health Services.